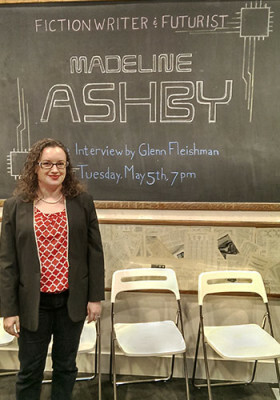 On Tuesday, May 5th, Glenn Fleishman came to Ada’s and interviewed Science-Fiction writer and strategic foresight consultant, Madeline Ashby. Their conversation explored a range of topics, starting with Ashby’s own fiction, specifically vN, Book 1 of her Machine Dynasty Series. They then moved to discussing the Hugo awards, which led to a somewhat sticky conversation about the nature of being, thinking, and living in the depths of a world rapidly transforming socially, physically, and otherwise. Glenn (and the audience) closed with some questions to Ashby about her day job as a strategic foresight consultant, in which Madeline “charts a space through time,” usually commissioned by a company, exploring what may come to pass and crafting a compelling narrative to go along with pie charts and predictions. The absolutely amazing Madeline Ashby. After the event, in-person and digitally, Blaine (one of Ada’s bakers) and I had a few conversations spurred by a few of the more provocative points Madeline and Glenn discussed. One particularly poignant statement we both picked up on was made in the context of the controversy surrounding the 2015 Hugo Awards. Madeline said that we all have a tendency to “presume people think like (we) do, but generally, they don’t.” Though perhaps a bit of an obvious statement, I think it is equally powerful. Whether positively or negatively, humans must regularly navigate the disparity between our processes of thinking. Imbuing your actions with a recognition of difference may be a way to bridge gaps between people approaching a conflict in different ways, or at least a way to mitigate frustration when questionable (or outright despicable) decisions are made. Blaine and I also talked about a point Madeline made pertaining to the present energy crisis. Since the interview took place about a week before the Seattle kayak demonstration against a Shell oil rig, fossil fuels and drilling made for an easy focal point. Madeline and Glenn discussed how, technologically, we have the tools to affect massive, positive change to the ways we collect, store, and transmit energy. But changing an institutional culture is more complicated than changing one physical method. Ashby made the point that the central issue is one of sticky relationships. It’s very difficult for companies to go to people (a country, for example) and say, “We know your entire economy and livelihood depend on fossil fuel biz, but we are pulling out.” Change can and will happen, but it will take time and more than technology alone. Institutional change necessitates methods of transition and solutions to the problems that will arise when decades or centuries of precedent are disrupted and overturned. Good policy and legislation is a starting point, but the responsibility falls on the entirety of humanity to actively pursue compromise and effective actions. The final point I’ll emphasize (as a means of encouraging one to listen to the interview) was a point Madeline made about the singularity. “What if the singularity has no personality?” Many (all?) popular conceptions of the singularity are an “artificial intelligence” suddenly thinking the same way we do and then committing an act steeped in the most heinous of human capacities. Alternatively, it seems a better course of action would be for an intelligence to not make itself known, but instead to start acting in it’s own interest, which would not include alerting a competing intelligence to its presence. Apart from the flawed logic, to think that a created intelligence has achieved the zenith of its being when it looks and acts like human intelligence is a reflection of our own egos and dogmatic view of intelligence as such. With that I suppose one could say that the theme of the night was humility–things may not be as they appear, and they are almost definitely more complicated than we accept or readily imagine. Good thing we have talented fiction writers out there to help us break away from the obvious and explore the abstract. Glenn and Madeline covered a lot more in their conversation, the entirety of which is available here, on Glenn’s website. Also check out Madeline Ashby’s Machine Dynasty Series, starting with vN, followed by iD, and soon to be added to with the upcoming REV. This entry was posted on Thursday, June 4th, 2015 at 10:39 am and is filed under Ada's Events, Reviews. You can follow any responses to this entry through the RSS 2.0 feed. Both comments and pings are currently closed.